Arbaeen e Nabvi S.A.W ( 40 Hadiths) Authored by Professor Abdullah Shaheen. 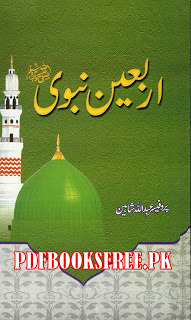 Arbaeen-e-Nabavi s.a.w book is collection of forty Hadith along with its virtues in Urdu language. Prof. Abdullah Shaheen has collected these Ahadiths which is short in text but possesses great social utilities. Click on the following links to read online and also download a free copy of this beautiful book in Pdf format for offline reading and references.